Also appears as "RCA Victor Records". The change of logo occurred in 1967. The RCA Victor brand was introduced in 1945 in advertising and 1946 on actual record labels, where it replaced the Victor and Bluebird (3) brands. Until then, on records, the RCA Victor division of the Radio Corporation of America only used the Victor brand, which was acquired in the Victor Talking Machine Co. takeover in 1929. During its lifespan, the RCA Victor brand has undergone many design adjustments. The latest one was created in 2010 for French releases, by Sony Music Classique & Jazz. For all Unofficial / Bootleg releases of this label please use RCA Victor (2). In late 1945, RCA introduced vinyl 12" records to consumers as part of the RCA Victor Red Seal' De Luxe Edition line, following the release of similar V-disc releases for the military during WWII. RCA introduced Stereo 45 singles in 1958. Stereo-only recordings from 1958–1960 were the 8500 series 61-85xx. 1958–1961 recordings with both Mono and Stereo releases were the 7000 series, 61-7xxx for stereo and 47-7xxx for the mono counterpart. The 45 rpm stereo format was discontinued in favour of the 7" 33 1/3 rpm, which was introduced in 1959, and used 1959–1964. In September 1965, Ford Motor Company introduced factory-installed and dealer-installed eight-track tape players as an option on three of its 1966 models (Mustang, Thunderbird, and Lincoln), and RCA Victor introduced 175 Stereo-8 Cartridges from its RCA Victor and RCA Camden artist's catalogs. In the 1960s and beyond, sometimes RCA Victor branding was split such that logos for "RCA" and "Victor" were on the same surface but somewhat separate. These should still be considered a representation of the RCA Victor label, as per forum discussion. A common combination in this era had logos for "RCA" on the packaging and for both "RCA" and "Victor" on the media—in this case, both RCA and RCA Victor should be entered as labels, with a release note along the lines of "RCA on sleeve, RCA Victor on labels". Do not use Victor as a label on these items. 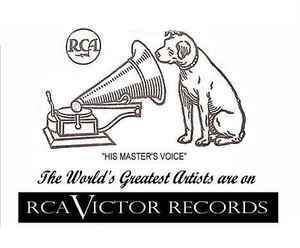 On some Victor releases prior to 1946, especially 78 RPM albums (multi-record sets), the packaging & inserts sometimes had a circular RCA logo next to a circular dog/phonograph logo, without any words. Although this might be construed as an "RCA Victor" label, they should be considered just Victor releases, as indicated by the labels on the records within.